Hugh Asher Howard Jr. was born on July 10, 1924 in Knox County, Kentucky. He was the child of Hugh and Chelsea( Marsee) Howard. He had one brother -James. Hugh attended the Corbin Independent school system and graduated from Corbin High School where his father was Principal. 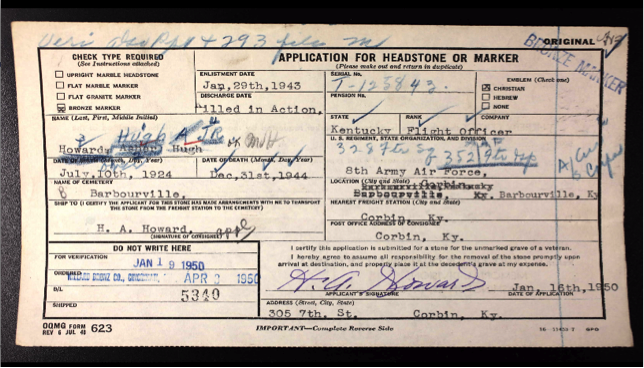 At 18 years of age, Hugh enlisted in the Air Force on January 29,1943 in Barbourville, Kentucky. Hugh served in the 8th Army Air Force as a flight officer and was killed in action on December 31,1944 after almost two years of service.